When President Obama delivered his much anticipated jobs speech on Sep. 8, I was actually driving on one of those highways the President said would benefit from the infrastructure spending included in his proposed $447-billion American Jobs Bill. Listening to the live speech, and judging from the audience reaction, it was a good speech reminiscent JFK-style and was what American public wanted to hear. However, the proposed bill is short on implementation detail, and the claim that “Everything in this bill will be paid for. Everything” seems more of a wishful thinking and empty rhetoric as it rests on the assumption that the resulted budget and deficit cuts would not be rolled back by future leaders and policymakers. And that, of course, would not be President Obama’s problem. Looking at the proposal on the basis of allocation, there does not appear to be any provision for the public sector, which is shedding jobs at an accelerated rate outpacing the job gains in the private sector due to budget cuts, revenue losses, and the winding down of the stimulus package. 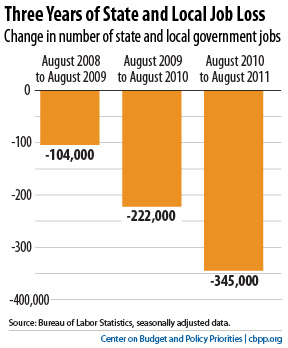 U.S.News noted that since the end of the recession, government employment–including federal, state, and local jobs–has fallen by roughly 600,000. Furthermore, there’s no provision for the housing sector which is still hemorrhaging from the financial crisis dragging down the rest of the U.S. economy. In the speech, the President made reference to China’s construction spree noting that the U.S. has the capability as well to build out infrastructure on its own. The heart of the matter is that Beijing gets that ….three years earlier than the Obama Administration, which made a decision to go the ‘alternative’ route. As a result, China has overbuilt in some areas, and its “ghost city” has become somewhat an international laughingstock. But on the other hand, it also suggests China would rather have many ghost cities and empty railways than risking an economic recession. Meanwhile, it is fair to say the under-funding and poor condition of many roads, bridges and ports in the nation could soon turn the U.S. (still the largest economy in the world) into a laughingstock as well. Does, for example, health care reform, in the middle of an unprecedented recession, really add to net new jobs, without taking jobs away from other sectors? If the answer is NO to #1, then the second logical question would be: Should we wait till after the economy gets back on its feet? The ARRA 2009 was literally a no-questions-asked check of $787 billion reflecting the excitement and support of a newly elected (and charismatic) President. The political and fiscal climate then was one such that stars were aligned for President Obama (and the Democratic Party) to go down in the history book as the hero turning the U.S. economy around from the Great Recession…had the resource been properly utilized and implemented. 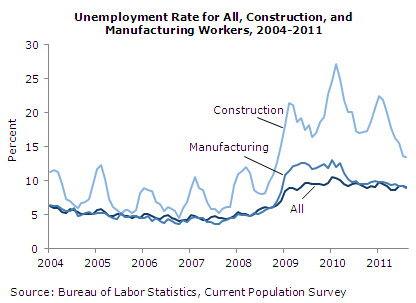 With the deteriorating domestic housing market, the unemployment rate of the construction industry peaked at 27.1% in February 2010 (See Chart Above), and just lost another net 5,000 jobs in August. One has to wonder what difference it could have made had the ARRA 2009 been allocated the old fashioned (and proven) way—heavy on infrastructure and other business-friendly programs to spur growth. Large scale infrastructure projects typically take anywhere from 6 to 24 months to go into the actual construction phase. So even if an infrastructure stimulus program is put in place today, the more significant impact on employment most likely will not be seen for another year or two. On the other hand, had the infrastructure program been implemented three years ago, the expected benefit to the labor market would have manifested by now. Obama challenged the lawmakers to “pass this jobs bill now”. Unfortunately, unlike the time of the ARRA 2009, the GOP is now the majority, and will not be as cooperative, and helpful to President Obama’s re-election. So most likely, the final version of the Jobs Bill could be further watered down. Some analysts said that the Obama camp could call it a victory with 50% of the proposal passed. By refocusing on infrastructure with this newly proposed jobs bill, the President seems to have admitted as much the mis-direction of the first stimulus package. Nonetheless, since Obama missed the best opportunity three years ago, it is too late for a do-over now.